Before I came to Human Nature, I was a postgraduate student of Hong Kong Polytechnic University. I got immersed into different design approaches with advanced technologies and international mentors. Upon completing this program I felt conflicted about whether to extend my stay for a career in design and electronics or to go back to Manila and share my new skills from a first-world country. The ‘iskolar ng bayan’ inside me was stronger, so I felt an urge to return and share my knowledge, and explore a path where more Filipinos can benefit. Even if I was joining a startup, I didn’t really worry, I was more excited because I felt I could be part of something that can grow bigger. The first thing that struck me about Human Nature was the people, who were genuinely nice and happy, especially those I work closely with. My work environment before didn’t invite as much positivity. There was too much gossip and crab mentality. This design team, in contrast, has always been crazy and fun despite the 'urgentinians' and 'rushians' (extremely urgent deadlines). The exciting yet challenging part of a Visual Merchandiser is you get to create spaces that allow consumers to understand your story and experience your brand. 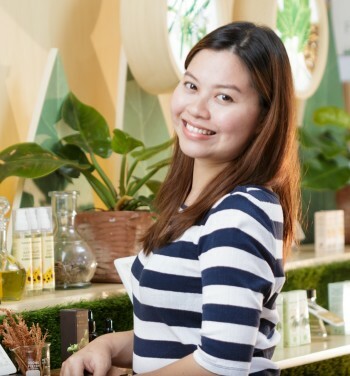 Through visual cues and experiential areas, we not only inform Human Nature shoppers about our natural products but we also let them feel that they are contributors to our advocacies. Although we’re still in the process of establishing standards, in the near future I hope I can say that I am part of that small startup company which grew into a world class producer of natural products.